Members and friends of the Atlas Foundation of New Orleans hosted a “Dinner of Abrahamic Traditions” on Jan. 17. The dinner, which included Turkish food, was held at the Knights of Columbus Hall at St. Catherine of Siena Church in Old Metairie. Sponsors for the dinner included St. Catherine of Siena Church, Trinity Episcopal Church, Rayne Memorial United Methodist Church, Our Lady of the Lake Roman Catholic Church, Fountain Magazine, Fatoush Restaurant, Don Fortunato’s Pizzeria and CapLand Embroidering. During the dinner, invited speakers address the topic of family and religion. Speakers for the evening were the Rev. 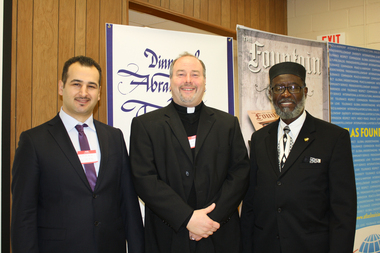 Buddy Noel, associate pastor at Our Lady of the Lake Catholic Church in Mandeville, and Rafeeq Numan, imam at Masjid ur-Rahim. Each speaker addressed the importance of faith in families, noting that despite cultural and religious differences, family is important to all people. Both speakers spoke of their own experiences with their individual families as well as emphasizing the importance of members of different faiths working together toward a more peaceful world. The Atlas Foundation has two branches in Louisiana: one in Baton Rouge; and one in New Orleans. It is a nonprofit, multicultural faith-based organization operating for spiritual and educational purposes. The Atlas Foundation offers interfaith programs, Turkish language classes, organized trips to Turkey, and various programs to promote common ties among people of different faith and cultural backgrounds. The foundation has a partnership with Trinity Episcopal Church in New Orleans. Through dialogue, the Atlas Foundation hopes to foster understanding, tolerance and respect for each other. This was the first year for the Dinner of Abrahamic Tradition. Atlas Foundation director Emrah Aktepe hopes to make the dinner a yearly tradition for the faith community, allowing for communication between members of the faith community to flourish and prosper. Aktepe said, “I hope this dinner will become a festival for the faith community here in the New Orleans area so many people can come to share ideas and thoughts of promoting interfaith unity.” To learn more about the Atlas Foundation, visit their website at www.atlaslouisiana.org.